Now with additional screening for Flood and Energy & Infrastructure risk. 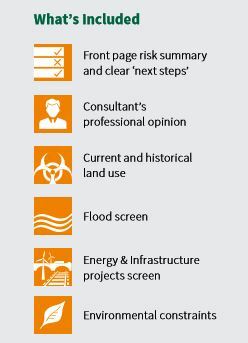 Sitecheck Assess is a full contaminated land risk assessment and now includes a definitive flood and energy & infrastructure screen. Driven by recently upgraded and best in market risk models, the result of these screenings is highly accurate and clearly indicates where further due diligence is required. In addition, content and design upgrades will provide your clients with better clarity of information and next steps guidance. A desktop report designed to highlight the risk of the property being designated as Contaminated Land under Part 2A of the Environmental Protection Act, satisfying the requirements of the Law Society Contaminated Land Practice Note. The report also provides a radon assessment, as well as a Flood and Energy & Infrastructure projects (such as fracking sites, solar or wind farms and HS2) screen. 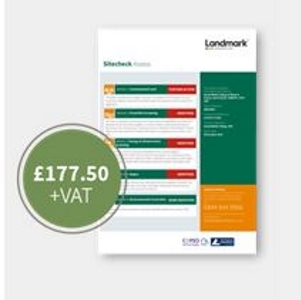 Where the client is able to provide Landmark with sufficient further information, the report will be re-reviewed at no extra cost. If the additional information mitigates the cause of the original result, a new ‘Passed’ certificate will be issued. This service is available free of charge when the customer provides the required information.